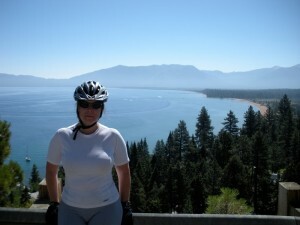 Lynda with Lake Tahoe in the background. Six years of tandem riding has taught me several things, one of the most important being that Lynda will always be more motivated if I invent a ride theme. She is a big bike commuter. She shames me every season by biking to work daily, but for her, riding for the sake of riding is a tough sell. There needs to be a purpose, a carrot at the end of the stick. Initially I thought the themes had to be fanciful, like an albino peacock or a herd of wild horses. (The peacock I had seen from a distance turned out to be an emu, but it was still a great theme.) Unique destinations worked well, but I discovered that even utilitarian tasks could be sufficient motivation. We once biked almost 30 miles roundtrip to buy a phone charger. We rode to look at houses and once a specific house feature. I kept finding a reason to cross town – a new breakfast place, visiting friends, basset hounds, cocktails, anything would do. And then I hit on overnight rides. This theme has been perfect because it gives us a new destination as well as the confidence to start planning a longer tour and the chance to scope out parts of that ride. I bike tour for at least a week annually, but we have been slow to try tandem touring. Lynda’s lack of long-ride experience and strong aversion to suffering partially explain our dawdling. We have also been concerned about carrying heavy loads on a tandem, especially up big hills where tandems feel less efficient. So, overnight bike rides work nicely and also give us nested themes. One recent overnight combined fall foliage, mountain and valley views, a great French restaurant, and a new bed and breakfast. So many layers, she could not turn it down! The natural beauty makes Washoe and Carson Valleys in Nevada home to excellent road cycling. We took advantage of perfect weather over the long Nevada Day weekend to ride our tandem bicycle from Reno to Genoa, staying at the Wild Rose Inn. Patrick and Lynda Walsh on an overnight tour in the Sierras. Lynda and I started riding under the red and yellow maple and oak trees of Old Southwest Reno, where pre-1940s houses range from small brick bungalows to mansions. The city’s Tree City USA designation ensures the health and beauty of the wide variety of species found throughout the neighborhood. We continued over Windy Hill, which thankfully was calm, and we rode past ranchettes with horses, cows, and emu in Holcomb Ranch. We were spit out on busy South Virginia at the perfect time for an early pizza lunch before striking out along Old South Virginia. This quiet road is a well-known bicycle route to locals due to a dead end for cars but where bikes can pass – it still does not show up if you ask Google for bike directions. At the corner of Mt. Rose highway and old 395, we headed south on the 5 lane road, which was one of our apprehensions about this ride. The recently opened I-580 drew away all of the traffic from old 395, and the generally wide shoulder afforded quiet riding at a comfortable pace. From the road, the new Galena Creek Bridge appears to cradle the tops of the bright yellow Cottonwood trees lining the valley. We passed the Bowers Mansion with the grounds in peak foliage then over the big hill at Numage Pass and down Combs Canyon Rd. The nearly flat bike path through Carson City was a pleasant rest before the long hill on Jacks Valley Road. This climb got us off of the busy portion of 395, but was tedious on the tandem, and Lynda pinched me for the unnecessary hill. She read about pinching in an issue of Adventure Cycling and eagerly adopted it as her preferred language for letting me know that my plans are too ambitious. We decided to skip this hill on the way back in favor of the easier route in the valley. Dave was outside working on the Wild Rose property that he and his wife Jeannette recently purchased. The Inn is very comfortable, and there were five deer in the yard within an hour of our arrival. We had drinks with the owners before walking a block to dinner at La Ferme. For food lovers, La Ferme is easily the best restaurant within 50 miles, maybe more, serving classic French food with personalized if sometimes quirky service from the owner, Gilles. The meal included pumpkin soup served in an actual pumpkin, magnificent duck confit with pommes maxim, and 8-hour pork shoulder. Afterwards, Gilles gave us a tour of his little store of unique items. Following our romantic dinner and tour we walked back to the inn, which was only a block away. It would have been a perfect night to use their hot tub, but we had forgotten swim suits. Instead Lynda took a hot bath, and we cuddled up in our cozy room and fell asleep watching a movie. The morning breakfast was a nice baked egg dish with muffins, juice, and coffee. We got back on the road and took different routes where possible to make the ride more of a loop. Riding back, we talked about the next stages of our spring tour from Reno to San Francisco. Tandem touring is a new pool that we are wading into, and we will ride inn to inn before going into full camping mode on a future tour. This weekend was a baby step in this progression, and it allowed us to get a feel for it without the commitment of a big ride. Novice solo bike tourists can do the same, and I am dabbling in bikepacking in the same way (more on that in a future article). This weekend’s results could not have been better, and now we are confident that a five-day tour will be a fun challenge. Our most common and one of our favorite area overnights is to ride around Lake Tahoe, an attraction that provides its own theme. This is a popular 72-mile day ride, and dividing it into 2 days makes for a more relaxed spring and fall adventure, giving time to soak in the water or relax on a beach. After a few rides, we found that we prefer riding counter-clockwise, which is opposite of typical organized rides. Riding this direction provides a big shoulder on a few key climbs and we think is less stressful. Most recently, we started on the west shore, a few miles south of Tahoe City. Abundant viewpoints made the first afternoon’s ride to South Lake really memorable, most notably the view over Emerald Bay and the tight switchbacks downhill afterwards. These curves are pretty tight even in a car. Steering the tandem took some effort. The area before Emerald Bay seems less busy, so it was a pleasant evening after a Friday at work. Parts of the lake have bicycle paths, but we skipped most of them because of somewhat regular road crossings on the west shore, preferring to ride in the shoulder. We stayed at the Tahoe Lakeshore Lodge and Spa, where the newly remodeled room was very comfortable with nice views across the lake. We enjoyed the pool and hot tub, and we had a fun time eating at Freshies, a Hawaiian restaurant within walking distance that has Pliny the Elder on tap – one of the best IPAs you can find. Soaking in the hot tub relieved our muscles and helped melt any stress from the work week. We started off with breakfast in our room before getting an early start and riding through the Cave Rock tunnel and the big hill on 50 early to avoid traffic. Sometimes I am maybe a little too ambitious, and our start was so early that we saw only 2 cars on the hill. The ride north along the east shore was spectacular with great early morning views of the sun hitting the mountains on the other side of the lake. The early start also meant it was pretty chilly for the first hour. We stopped at Starbucks in Incline Village to warm up and grab some calories before finishing the day’s ride surprisingly quickly. We were finished with the 46 miles before lunch. Next time we will take a little more time and relax on the shore.